Calling all scoundrels, rogues and ne’er-do-wells – Captain Jack and the crew of the Black Pearl want you. 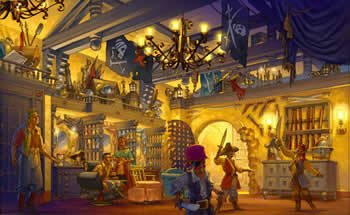 Each guest checking in at the plunder-filled pirate’s lair gets an official pirate name. Then it’s off to Muster Station for applications of beards and eye patches, scarves and scars, earrings and gold teeth – all done with the savvy skill of a veteran pirate who shares his own tales of sea-sailing adventures. After the new buccaneers recite a sacred pirate oath, they are officially part of Captain Jack’s motley crew, leaving their old identities behind. Past a hidden portal and into the treasure room, the shipmates have their “pirate portrait” taken before being turned loose on an unsuspecting Adventureland – and no doubt feeling right at home at the Pirates of the Caribbean attraction. Costumes, headwear, and imaging sold separately and are available at the location. To celebrate the release of “Pirates of the Caribbean: On Stranger Tides,” The Pirate's League at Magic Kingdom Park is adding a new package just for enchanting girls. "The Mermaid's Transformation Package is for bold, daring girls who want to evoke the radiant and cool colors of the ocean. This limited-time transformation is for girls who want to have their inner mermaid shine through. · A luminous make-up transformation that evokes the iridescent and vibrant colors of the seas. · A full-sized bottle of Pirates of the Caribbean: Mermaid’s Tears Nail Lacquer by O.P.I. · Plus a special Pirates League Sheath and a special gift from O.P.I. – the O.P.I. Pirates of the Caribbean Mini Nail Lacquer Set"
Don’t delay, the package will disappear back into the depths of the sea on July 2, 2011. Boys, girls and grownups ready for the pirate life start the process by calling 407-WDW-CREW (939-2739). Reservations are strongly recommended and can be made up to 180 days prior to arrival. A valid accepted credit card number is required at time of booking. A $10 cancellation fee will be applied to such credit card for all no-shows or if reservation is cancelled within 24 hours of experience. Open 7 days a week from 9:00 a.m. to 4:00 p.m. The last reservations will be taken at 3:30pm. No discounts apply unless otherwise noted. Guests must be at least 3 years of age. Children must be accompanied by an adult at least 18 years of age or older during the entire experience.